You can browse the catalog without logging in, but you can't borrow anything. A Library ID consists of a user id and password. You use these to log in and then reserve anything in our catalog. After this request is received, an account will be created for you, and an e-mail will then be sent you with your user id and password. Having an e-mail account you frequently check is a necessity. E-mail is used for all communication from the library to you. It's vital for letting you know when something you reserved is available for pick up. Also make sure that e-mail from our parish's domain (smmcc.org) does not end up in your trash folder. If email messages from St. Mary Magdalene are filtered as junk, you must correct this condition - usually by going into your email tools and defining "smmcc.org" as a safe sender. We cannot notify you by phone regarding material pick up or drop off. Phone numbers are required, but only to be used as a last resort for contacting borrowers who have not returned an overdue item. If you can't personally meet these conditions, please ask someone close to you to allow their e-mail account to be used for the purpose of your library transactions. When you reserve any material in our virtual library, you agree to return it in the condition you borrowed it. If it's not returned, or returned damaged, restitution for the loss or damage will be required. Failure to do this will result in suspension of your account. 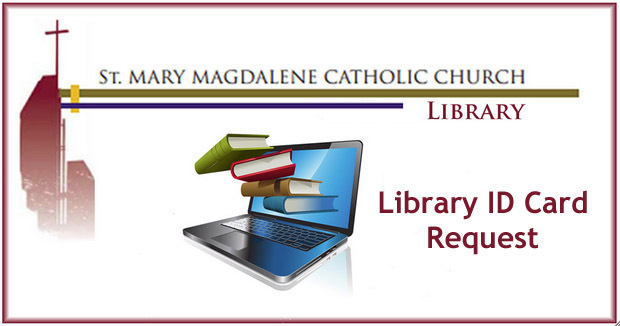 Also note that library accounts are available only to registered parishioners of St. Mary Magdalene. Thank you. We hope you will experience joy and growth in your faith as a result of your participation in our parish's innovative Virtual Library. Submit your request and return to the Library Home Page.